For me, the idea to use electronic notebooks originated with a visit to Dow Chemical as part of an AACT Teacher Summit. As we toured the labs, my fellow teachers and I were interested to learn that the Dow scientists did not use hardcopy, paper notebooks — but rather, captured everything electronically. Since my school has a 1:1 laptop program (all students either rent a laptop from the school or provide their own), I wondered if I could make electronic notebooks work for my chemistry classes. If it worked as I’d hoped, not only would I be integrating laptop use into my teaching, but I would also be modeling how data was being captured in actual research labs like the one I visited. My first step was to see if there were any existing electronic notebook programs. Although I found a few, none seemed to meet my needs. During this review process, my goals evolved, and I decided I wanted the electronic lab notebook to function more broadly than as just a data collection mechanism. I envisioned my students capturing data and creating multimedia lab reports and other post-lab experience analyses in one combined electronic portfolio. From this point on, I will use the term “e-notebook” to indicate this broader use of the technology to capture student work. I teach three levels of chemistry: regular, advanced, and AP. I decided to jump in with e-notebooks for all three levels, since that would give me a way to see how they functioned in real time in different types of classes. My hope was that this would be a year of experimentation, at the end of which I would have fine-tuned how to use the e-notebooks. Since Google Drive is already heavily used at my school to complete and submit assignments, I decided to try Google Sites, a web-design extension from Google, as a platform for the e-notebooks. At the start of the year, each student created their own e-notebook in Google Sites for my class. 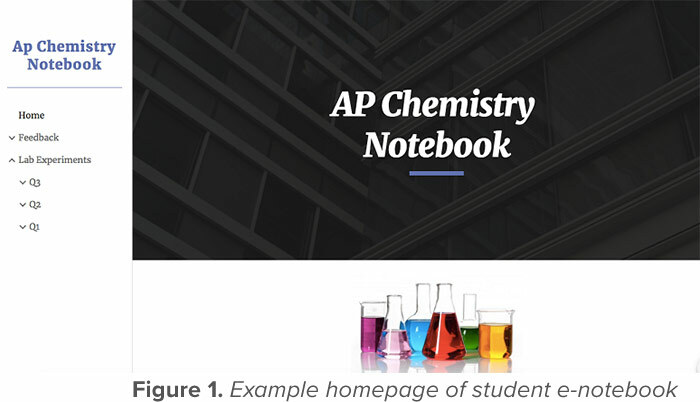 The home page of the e-notebook includes the student’s name and a chemistry-related cover picture of their choice. Sub-pages are constructed for each quarter and then each lab entry is added as a new sub-page under the appropriate quarter. I have utilized the e-notebooks differently in the three levels that I teach. For each level, I created a generic entry template that describes the general pre-lab, in-lab, and post-lab expectations. Students are encouraged to look at this template as they construct their e-notebook entries. In addition, I provide instructions specific to the e-notebook entry for each particular lab as well as instructions on how to create each e-notebook entry section. (See challenges section below for additional discussion on this point). Prior to beginning most lab activities, students create a pre-lab section of the e-notebook entry. Depending on the level, this is created independently or as part of class activities. The length and breadth of this section also varies. For general chemistry, it can be as simple as date, partners, and purpose; for AP Chemistry, it can include more extensive pre-lab assignments. For all levels, students create blank data tables using Google Docs that they populate as they collect data during the lab. These documents are embedded in the e-notebook as “living links,” so they update automatically as the student adds data. 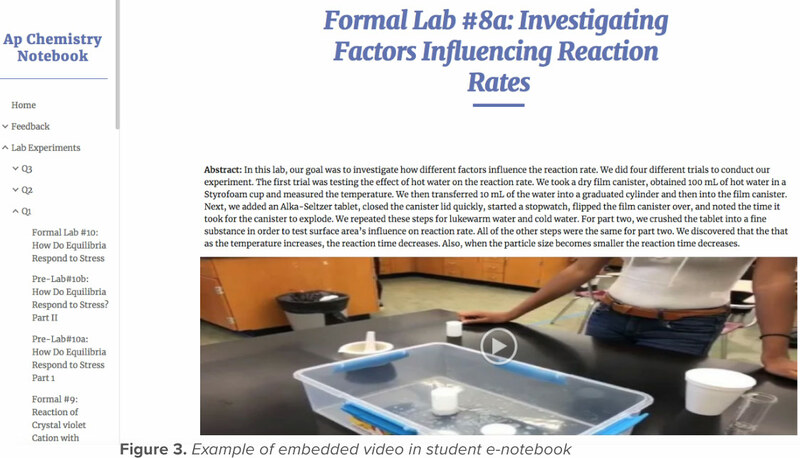 After the lab, students either complete guided lab reflections or formal lab reports (based on lab and level of class) which they add to the e-notebook entry for that lab. I also have each student complete a post-lab reflection, where they summarize the goal of the lab and reflect on their level of mastery of the related content/skills. All documents that students use to create their e-notebook are also saved in a Google folder that is shared with me so I can access them when I view the site. In addition, I have the students set up their Google Sites e-notebook so that I have editing privileges. Having used e-notebooks for over half a school year, it is apparent that they provide many advantages over traditional paper notebooks. One advantage is the ease of access to the information. There are no hard-copy lab books for students to remember to bring to class or for me to carry home to grade. The e-notebooks can be accessed from anywhere at any time, as long as there is Internet access. Compared to carbonless notebooks, where students submit the yellow copy of their work, it is much easier to evaluate the electronic versions, since I do not have to manage loose pages or decipher student handwriting. One advantage for students is the ability to integrate different types of media into their e-notebook. This allows students to document their experience and learning in a variety of ways. For example, students can embed photos of their experimental apparatus or time-lapse videos of what occurred during the experiment. On recent surveys about our use of e-notebooks, many of my students expressed an appreciation for the opportunity to use a variety of approaches beyond just writing to capture their experience and learning. A second advantage for students is the ease with which they can share materials, especially when we do experiments that generate class data sets, or where students work in groups. By embedding the data table as a “living link,” any updates will automatically be added to each student’s data table when changes are made. Due to the ease of embedding images from Google Drive, students can also embed hand-written work such as a diagrams or complicated math calculations that can be difficult to complete on a computer. Once the students have created their e-notebook entries, they have an organized record of both their work in the lab and their work using the lab experience to engage with the underlying content/skills. They can refer back to this work later in the year, as part of digital portfolios or other reflection pieces, or in future high school or college courses. While using e-notebooks has many advantages, it also has some challenges. Some challenges have to do with access to resources. I teach at a school where each student has a laptop and Internet access (at the very least, during the school day). When such access is unavailable, it creates a barrier to using this approach. 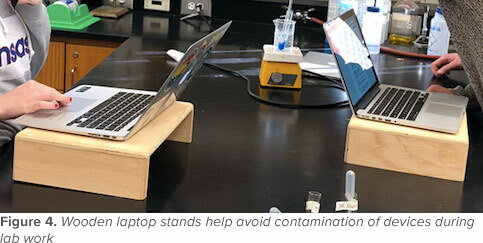 In addition, since the labs we do often involve chemicals, I need to be thoughtful about how the students can engage in lab activities using their laptops without harming or contaminating their devices. Our department has already addressed the safe use of laptops in lab by providing a classroom set of wooden laptop stands, allowing the laptops to be suspended above the lab bench. I have found that students who have limited organizational skills have difficulty keeping their e-notebooks organized and up-to-date. Their struggles include keeping all the individual sections in their shared chemistry Google Drive folder, as well as navigating how to incorporate them in their e-notebook. In addition to these considerations, there have also been some technical challenges using Google Sites as the host for the e-notebooks. For one, there is a learning curve with how to use the site, particularly with respect to the variety of ways information can be added. My solution for this year has been to provide students with a series of video clips that illustrate how to perform certain functions on Google Sites. Furthermore, since Google Sites takes a web-design approach, there are some aspects that are challenging for students. For instance, the edit and publish views are different from each other, and often one needs to publish and then view the published version to have full access to all of the information. Also, while the ability to insert “living links” from Google Drive is great for keeping everything current, having several embedded docs makes the site a bit clunky to navigate, and less than aesthetically pleasing. I have experimented with students using textboxes for all but their data tables, but this has the downside that the font editing options are limited. As the year has progressed, I added more instructions as to how to add specific information (as a textbox, inserting the document from Google Drive, etc.) to better support students as they construct their sites. I have also encountered some frustrations myself when evaluating my students’ work. The first one is that there is no “time stamp” or other means to track when changes are made to the site. The old version of Google Sites had this feature, but it has yet to be added to the new version. Secondly, if students neglect to put the Google files they use in their shared folder, I cannot access or evaluate them. In addition, the site needs to be “published,” or changes will not appear in the public version. A teacher cannot always just evaluate the “edit” view, since often not everything is visible in its complete form. My solution so far has been to “publish” each student’s work and then evaluate the public version. I am also still searching for a feasible way to provide meaningful feedback to students. I started by incorporating the feedback into the e-notebook itself by having a feedback page and uploading an entry for each student for each lab. Due to the logistics of accomplishing this, it was very time-consuming and I came to the conclusion that while I would like the feedback to be with the work, it was not worth the time required. Currently, I am creating feedback docs for each lab, and then adding them to the student’s shared Google folder. While this is also time-consuming, it is less burdensome than my first approach. It does, however, mean that unfortunately the feedback is separate from the students’ work. Based on recent surveys of my students, there is a mixed reaction to the use of e-notebooks. Many students really like them and feel they add to their experience, but others feel they are problematic in their current form. Although I agree there are still some problems to overcome and adjustments to be made, I think e-notebooks have shown promise as an effective way to capture and document student learning. One area I would like to focus on is how to better support my students as they learn to use Google Sites. I intend to look at their feedback more closely to see what specific steps I can take to increase their skills in building their e-notebooks. I would also like to expand the multimedia aspect of the e-notebooks. This summer, I hope to spend some time rethinking how students can utilize this aspect of the e-notebooks and how to adjust my requirements so that it becomes a larger part of what all students are doing (as compared to a mainly optional component, as it is now). This could include expanding the use of video as well as perhaps audio (voiceovers, etc.) or other creative ways to document and demonstrate understanding. While there have been some challenges, I am excited to continue to investigate how to effectively use e-notebooks with my students. Dr. Melanie Bartow Wills has been teaching chemistry at the college and high school level for over 12 years. She currently teaches at the William Penn Charter School, an independent K-12 Quaker school in Philadelphia, PA.